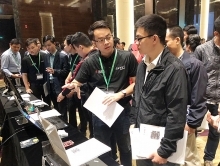 Avnet Asia Pacific has brought its Embedded Vision TechDays seminar series to Asia following a successful launch in Europe last month, kicking off in Vietnam’s Hanoi and Ho Chi Minh city in November 2017. “Vietnam is a high growth market at the front of the curve in terms of tech manufacturing and it’s one of our key markets in Asia. With our technical expertise and global network of technology partners, we enable developers and companies in Vietnam to innovate, differentiate, and reduce time-to-market,” said Frederick Fu, President of Avnet Asia Pacific. “Major advancements in automation and sensor technology as part of our increasingly interconnected world have made embedded vision one of the fastest growing trends in the electronics industry, giving rise to a wave of IoT innovations and applications. At Avnet, embedded vision is one of our focus areas that is driven by our technical expertise and global network of technology partners. We provide a complete system approach to support the growth in embedded vision, from system-on-modules to proven reference designs that move development directly to production,” he added. Among the many innovative solutions that Avnet has brought to the market, one of the solutions showcased was the Avnet-designed multispectral imaging platform for surveillance applications. It overlays video feeds to deliver a smart camera sensor reference platform that picks up heat signatures from the human body as bright red spots in the output video. By leveraging the Picozed Embedded Vision Development Kit that includes hardware, software and IP components necessary for the development of custom video applications, embedded engineers, system architects and FPGA engineers can develop smart camera video applications faster and more efficiently. Xilinx – solution for responsive and reconfigurable embedded vision systems. From idea to design and from prototype to production, Avnet supports customers at each stage of a product’s lifecycle. A comprehensive portfolio of design and supply chain services makes Avnet the go-to guide for innovators who set the pace for technological change. Learn more about Avnet at www.avnet.com.